Saver 100 fits perfectly juniors and adults as training or competition fins. Fins have rubber ribs and heightened side protection for directing the water flow. Rubber under the sole makes the fins nonslipping in start and during turns. Strongened fin-strap is recommended to fix your feet firmer in footpocket. Leg power transmission will be more effective if fins have a long heel. Foot protection makes fins more comfortable to use. As a material we use fiberglass ,produced in Russia, wich provides the highest quality and efficiency. Fin maximum measures are 65x24cm. Customize your fins with name & flag, foot protection, long heel and strongened fin-strap. 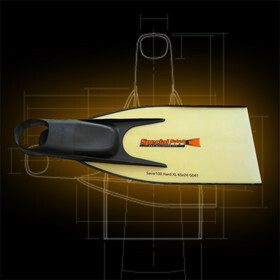 Saver 100 fins come with a ONE (1) year warranty for materials and craftsmanship.